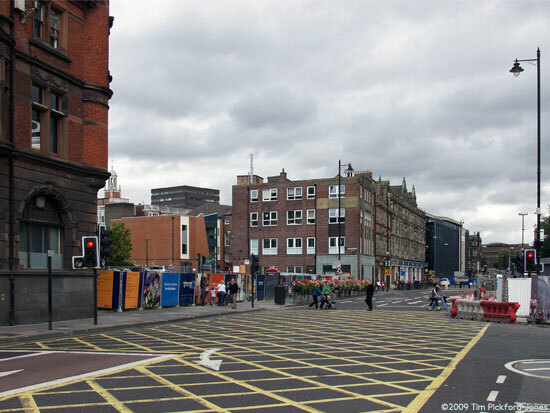 The new Metro Station at the Haymarket will soon be complete, but here are some other parts of Percy Street that have seen some changes over recent years. Opposite the Metro Station a splendid 1900 building stands, now part of the University. 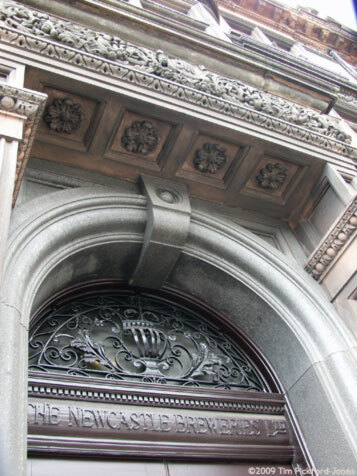 It was the home of Newcastle Breweries Ltd. until that enterprise moved to more spacious premises in Corporation Street. The brewery has moved again in recent months and the Corporation Street site has been flattened to make way for a University Science Park. The brewery is now in a characterless Gateshead industrial estate. Here are two views of Percy Street, 32 years apart. 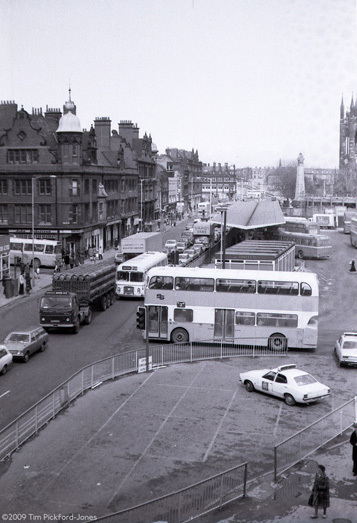 The first, taken in 1977, shows the Haymarket Bus Station on the right and just beyond that the Haymarket Metro station is being built. At this time Newcastle was a series of holes as the underground rapid rail system was being built. Here the cylindrical surface station concourse was taking shape. 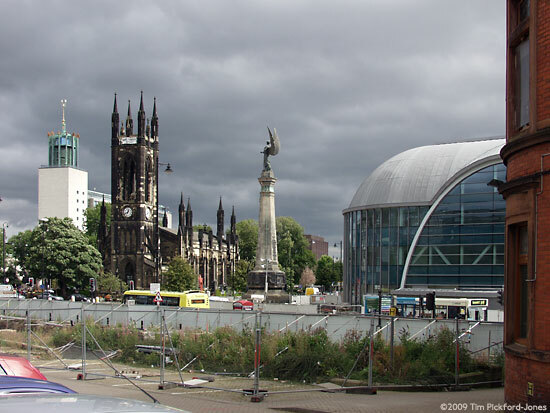 Note that the South Africa War Memorial is sticking up nearby, but minus its Angel sculpture. This was removed for safe keeping during the works, and was later replaced with new epoxy resin wings, as the originals had rotted away in the acid rain. 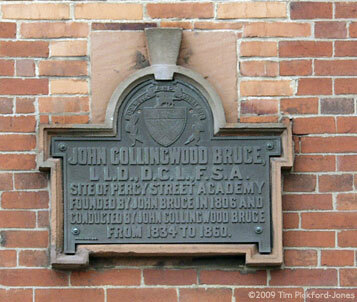 The brick building on the left, at the corner of St. Thomas's Street, is the Bruce Building, one of the first academic institutes in the city, founded in 1806. 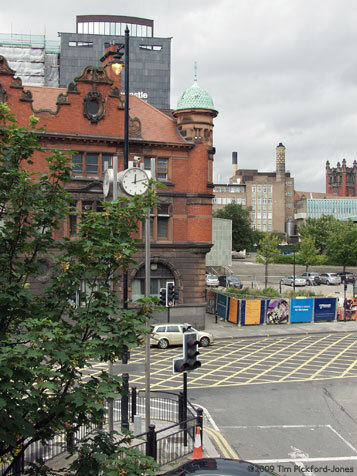 Beyond that range, taking in the Brewery building, is the white frontage of the ABC Cinema, That chain's flagship venue. 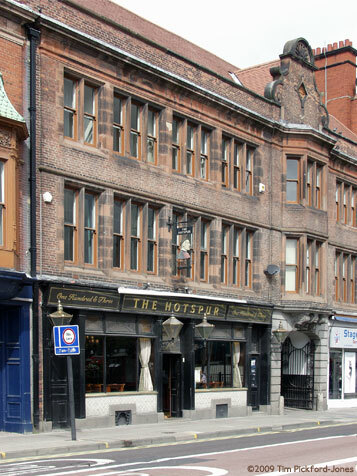 Next the building occupied by Thorne's Booksellers and Stationers, now a themed pub, remains, and beyond that the long lamented Haymarket Hotel before the University Welfare building juts out at the distant junction with Claremont Road. In today's picture a brand new University Media Studies Centre in vertical aluminium slats and planar glass takes shape on the Haymarket Hotel site. The hole where the cinema stood is currently being developed and the buildings to the rear of the Brewery HQ have been demolished in an L shape from the rear of the offices to the range now absent in St. Thomas's Street. Percy Street is named after the Percy family of Alnwick Castle Northumberland. Harry Percy (1364 - 1403) found lasting fame in Shakespeare's Henry IV Pt 1 as Harry Hotspur. He formed an alliance with the Welsh Owain Glyndwr to overthrow the then English King Henry. He was defeated and killed at the Battle of Shrewsbury and his body sliced up, with its head being stuck on a pole at York's entrance gates. Here is the corner of the Bruce Building and a glimpse up St. Thomas's Street. 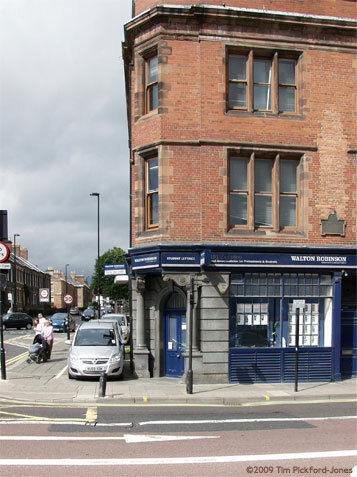 For years this corner retail premises was the home of Robertson's Fishing Tackle shop. It is now a posh estate agent, fishing for free money from the unwary. Adjoining the Bruce Building is the Hotspur Public House. This was one of the three famous and well used University pubs on Percy Street, along with the Three Bulls' Head and the Haymarket Hotel. The Hotspur is now the only of the three originals to remain. 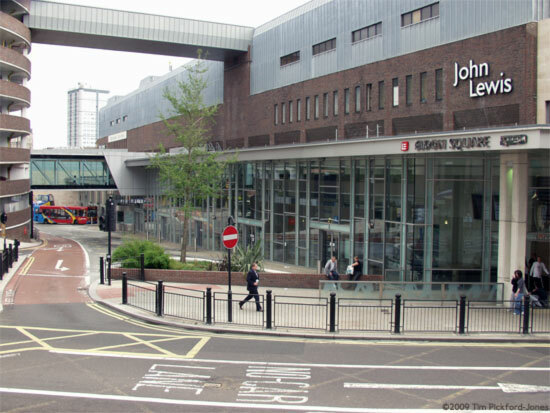 The Three Bulls' Head was demolished and a new version is now incorporated into the Eldon Gardens car park and offshoot of Eldon Square Shopping Complex. There is a vehicle access in the centre of this range that originally lead to the mews and Brewery Loading bays. 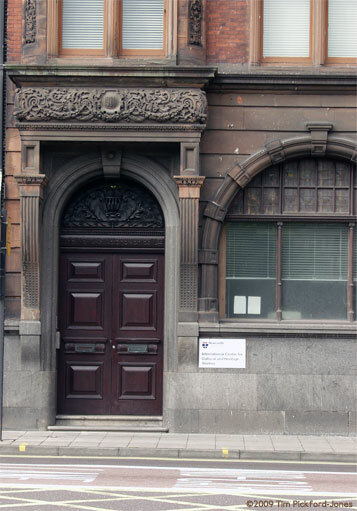 There was a similar gateway at the rear of the building. This is currently being preserved whist all around has been demolished. The remainder of the ground floor premises on this range are a Theatrical costumier and the famous M & N Newsagent, once one of the few places in the city where one could obtain those ever so dangerous under the counter publications; wink, wink, nudge nudge! 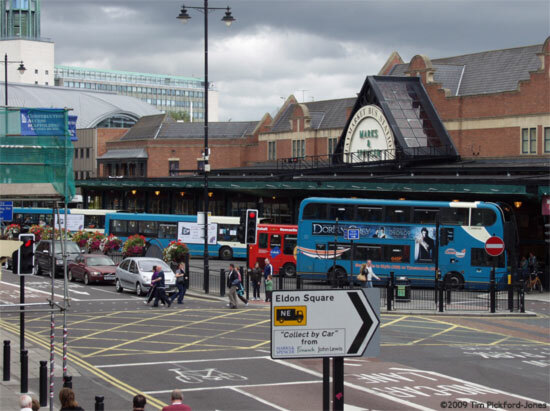 Opposite the Bruce Building and the Brewery site there are two bus stations and the Metro interchange. Eldon Square Bus Station was built recently to replace the underground Eldon Concourse, that was a depressing dull and inaccessible cavern under the shops, fashioned from a never completed east west road tunnel, abandoned when the T. Dan Smith and John Poulson corruption scandal broke. 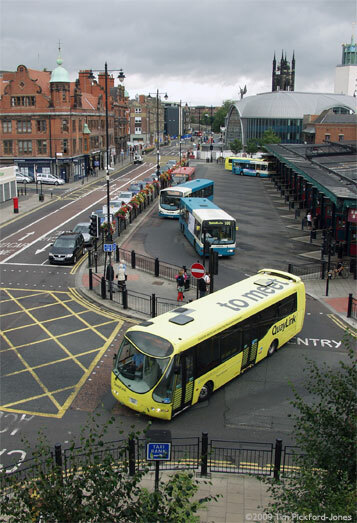 The Haymarket bus Station was provided by Marks & Spencer when that firm redeveloped the adjacent site. Its airy glass panelled roof is now shrouded in grimy green tarpaulins as the panes started to drop out with the expansion and contraction of the wrought iron frame. The Victorians could manage it 170 years ago, but the solution eludes today's architects. 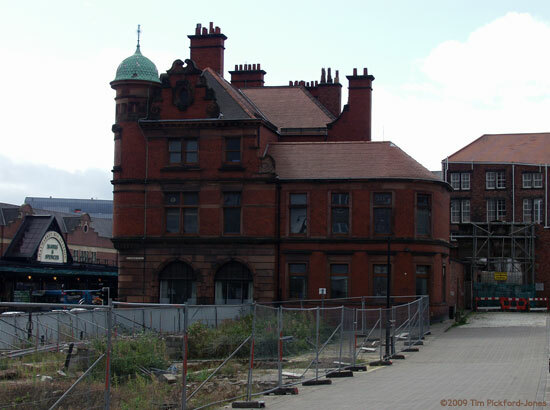 The Brewery building, erected in 1900 is the newest of the three in this collection bounding the western side of Percy Street. Seen here through the newly planted trees and the Callers clock, one of two presented by the now gone Callers Department Store in Northumberland Street in 1970, the northern edge of the Brewery offices looks at the hole being prepared for further University building work. The vantage point here is the balcony of the Old Orleans pub and restaurant. Everything seen to the rear in this view belongs to the University. So it's all change again in Percy Street, thanks to spending by the University. Those fees charged to foreign students seemed to have paid dividends. There has been an enormous influx of Chinese students in the past eight years, strengthening the already lively Chinese community centred around Barrack Road area and to the north into parts of Fenham.